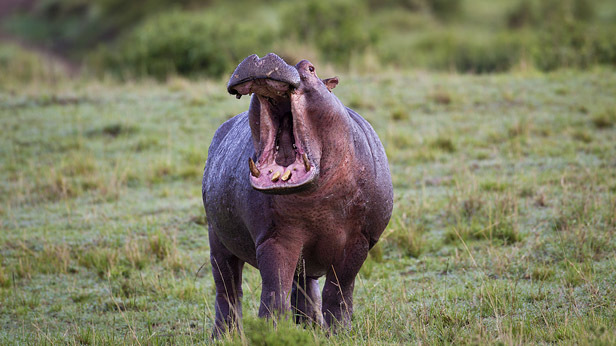 The hippo is responsible for more human fatalities in Africa than any other large animal. Male hippos actively defend their territories which run along the banks of rivers and lakes. Females have also been known to get extremely aggressive if they sense anyone coming in between their babies, who stay in the water while she feeds on the shore. Hippos can run at speeds of over 20 miles an hour and they have enormous jaws which host up to 20 inch canines. The most dangerous creature in Africa is probably the mosquito since it’s responsible for killing more Africans than any other through the spread of malaria, dengue and other diseases. Malaria kills over a million Africans every year, most of these are children under the age of five. Malaria is only spread by the female Anopheles mosquito. They are most active around dawn and dusk. There are in fact around 3,500 species of mosquito flying around and their average life-span is about two weeks. The Black Mamba (Dendroaspis polylepis) is one of Africa’s most dangerous snakes and feared in East, Central and Southern Africa. It’s aggressive when cornered and will not hesitate to strike. It can reach speeds of up to 12 mph (20 km/ph). It’s the largest venomous snake in Africa with adults reaching an average 2.5m. Black Mamba’s are not black at all, but brown/olive skinned. Their mouths are inky black which they show when threatened. Black Mambas live in savanna, scrub, tree hollows, and sometimes people’s homes. If a Black Mamba encounters prey it can strike up to 12 times, each time delivering enough neuro and cardio-toxic venom to kill a dozen men within one hour. Without anti-venom, the mortality rate is 100%. Crocodiles kill hundreds of people each year in Africa. The Nile Crocodile can be found in almost every major river throughout the continent as well as many lakes. Most fatalities occur while people are washing or collecting food near river banks and lake shores. Fishermen are also prone to attack as they slide their boats in and out of the water. Crocodiles attack by dragging their prey under water and drowning them. Some crocodiles will also then roll their bodies repeatedly to weaken their prey. Great White shark encounters are rare but attacks are serious when they happen, and have led to fatalities. While some adventure seekers will actively go out and dive with great whites, most of us should probably avoid contact.There have been more than 200 Great White shark attacks off the coast of South Africa in as many years. Great Whites attack by propelling themselves at their prey with great speed. They take a single huge bite and drag their victims down into deeper water. Then they let go and the prey just bleeds itself to death before being gobbled up. Lions live throughout sub-Saharan Africa (except for forests and deserts) in protected areas. A 2005 study showed that lion attacks on man were on the rise in Tanzania and Mozambique. Sick male lions are mostly responsible for the hundreds of human deaths that occur each year because lion attacks. The Puff Adder (Bitis arietans) is considered to be Africa’s deadliest snake because it is responsible for the most human fatalities. Puff Adders reach an average length of around 1 meter, and they’re solidly built with a wide girth. Color patterns vary depending on where they live, their habitats extend throughout Africa except for dense rain forests and deserts. The Puff Adder has large fangs and its venom is powerful enough to kill a grown man with a single bite. Puff Adders rely on camouflage for protection and lie still if approached. Because of this, people tend to step on them and get bitten. Many fatalities occur because bites are not treated correctly, leading to infection and gangrene. Cape Buffalo are said to have killed more big game hunters than any other animal (and so they belong to the Big 5. Buffalo are thought to kill around 200 people every year, first they charge and then they gore their victims. An injured buffalo is incredibly dangerous. When you see Cape Buffalo in Africa, they’re usually not alone. They appear in very large (and intimidating) herds. Even when looking at them through binoculars from a distance, the males always seem to be staring right at you with intense dislike. Weighing in at over 700 kg’s (1540 lbs) most lions don’t even dare take a chunk out of this beast. Buffalo will mob any predator that dares to take its young. While the African rhino (both black and white) are fighting to survive and their numbers are dropping at alarming rates due to poaching – it’s still important to keep your guard if you get the chance to see one in the wild. Rhinos are large mammals (only second in size to the elephant), an adult white rhino can weigh in at 6,000 lb’s. Rhinos are shortsighted, a little bad tempered, which makes them very dangerous. They’ll charge at full force and use their horns to kill or injure what they deem to be a danger or annoyance to them. Never get in between a mother and her baby, or anywhere near an older male.